How Do I Perform a Two-Way ANOVA in Excel Using SigmaXL? Ha (Interaction): There is an interaction between factors X1 and X2. Typically a Two-Way ANOVA analysis requires that you have balanced data, with an equal number of observations for each combination level of X1 and X2. In practice, this is often not the case and it is therefore not possible to perform a Two-Way ANOVA test. 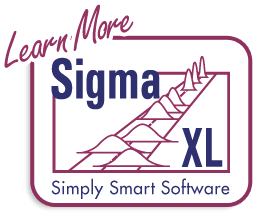 SigmaXL, however, accommodates unbalanced data. The minimum requirement is one observation per combination level of X1 and X2. An error message will be produced if this minimum requirement is not met. 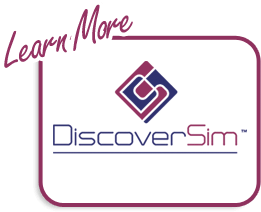 Click SigmaXL > Statistical Tools > Two-Way ANOVA. Ensure that the entire data table is selected. If not, check Use Entire Data Table. Click Next. 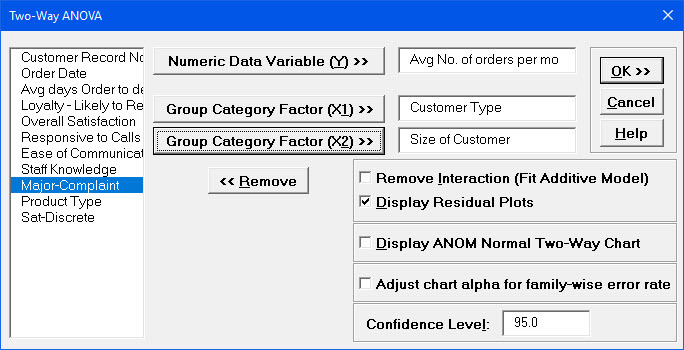 Select Avg No of Orders per Mo, click Numeric Data Variable (Y) >>; select Customer Type, click Group Category Factor (X1) >>; select Size of Customer, click Group Category Factor (X2) >>. Remove Interaction (Fit Additive Model) should remain unchecked. Tip: If the Two-Way ANOVA report gives a p-value for the interaction that is high (> 0.1), you should then press F3 or click Recall SigmaXL Dialog to recall this dialog, check Remove Interaction (Fit Additive Model) and rerun the analysis. Note that the mean values shown are fitted (predicted) means not data means. From the ANOVA table, we can see that the Size of Customer term is significant with a p-value less than .05. Customer Type is not significant by itself, but the Interaction term is significant. 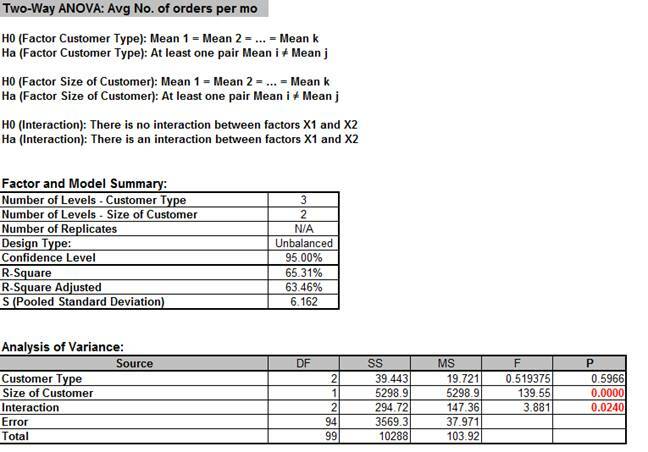 This indicates that the effect of Size of Customer on Average Number of Orders per Month depends on Customer Type (we could also equivalently say that the effect of Customer Type depends on Size of Customer). This is also confirmed looking at the Main Effects and Interaction plots. Customer Type by itself is not significant. Size of Customer is obviously significant. 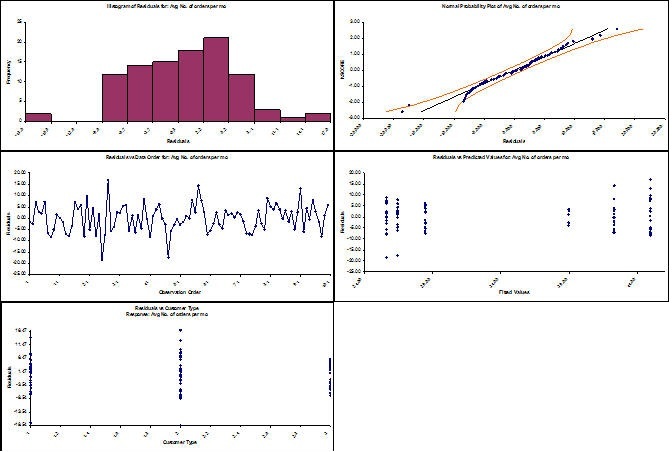 Looking at the Interaction plot, the different slopes illustrate that the change in Average Number of Orders per Month across Customer Types depends on Customer Size. This interaction effect is particularly evident for Customer Types 2 and 3. Residuals are the unexplained variation from the ANOVA model (Actual – Predicted/Fitted values). We expect to see the residuals approximately normally distributed with no obvious patterns in the above graphs, which is the case here.